We provide customised solutions to the institutional sector, bringing them our wholesome, high quality products. Del Monte Pacific strives to be the solutions-based, quality leader product provider for the foodservice and institutional sector. 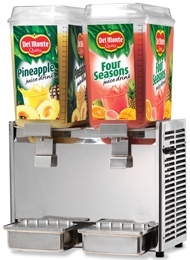 We can pack in customised formats, including sachets, large cans or bags and dispenser for juices, amongst others. Products include ketchup, sauces, packaged fruit, vegetable, bean and tomato, juices and many more. Our customers include quick service and restaurant chains, convenience stores, catering businesses, bakeshops, schools, hospitals, airlines and foodservice distributors. For more information on our foodservice offering in the USA, please visit www.delmontefoodservice.com. For all other markets, please contact us.